Follow Jesus through the Gospels with this daily devotion. You'll receive fresh revelation and a new love for the Lord as you gain insights into His teaching. 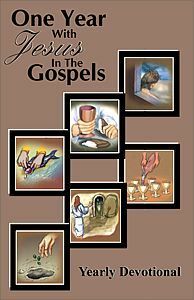 This is a devotional book which highlights some teaching or action of Jesus from the Gospels for each day of the coming year. You will receive fresh revelation and a new love for the Lord as you follow Jesus through the Gospels day by day. Each devotion has a practical application of Jesus' teaching that will help you to put these great truths into practice each day of the year.